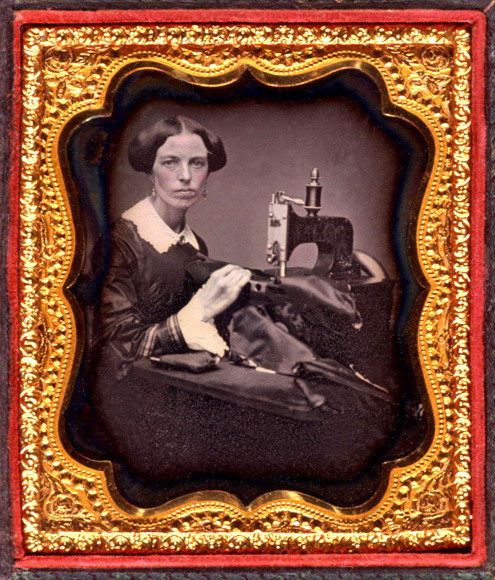 Today is National Sewing Machine Day. Ok, so this celebration is something I know nothing about. We do own a sewing machine but I can't remember the last time I used it. One Halloween we had the kids all set up with their costumes and the day before trick or treating my youngest son decided he wanted to be a padowan fighter from Star Wars instead of the pirate. We had worked on that costume for a couple of weeks (and spent some money on it... ) I told him Tough. It was too late and it couldn't be done. My older two boys had a different idea though. Admittedly they are more into Star Wars than I am and they could actually imagine what it was that my youngest son was asking for. They asked me if we were going to use the old brown futon cover that I had in the Goodwill pile. I told them they could have it. The next thing I new they had the futon cover laid out flat on the ground with their younger brother laying down, arms out to his sides, on top of it. They drew a chalk mark around Alex, cut out around the chalk mark, pulled out the sewing machine, and stitched up the sides leaving the top and bottom open. Viola! They tied a rope around his waste to finish off the look. They pulled out an old light saber toy from the toy box and Alex was set to go. The costume even had a hood. Best costume ever - especially because he could wear his warm, comfortable clothes underneath. He was thrilled. I was stunned. It was awesome.